Welcome to A10 Talk’s Top Pre-Season Top 25 Player Countdown for the 2016-17 season. Each day, we’ll be publishing a new article counting down our best 25 players for the coming season. Today, we feature #13 Justin Tillman of VCU. The freakishly athletic Justin Tillman is a favorite among VCU fans. 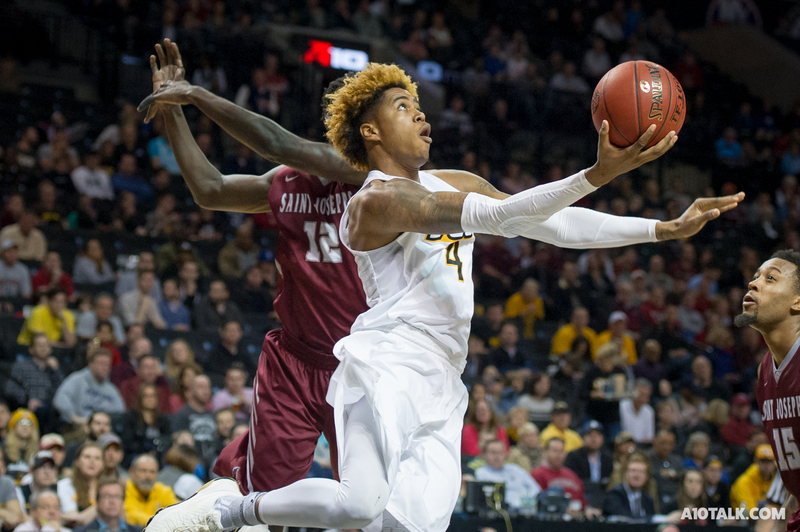 Known for his bright yellow-tipped afro and persistent energy on both ends of the court, Tillman is a key returning part of the Rams’ NCAA tournament caliber roster. After a slower freshman season, the Detriot native emerged as a solid sixth man for Will Wade in his sophomore campaign, averaging 7.2 PPG and 6.1 RPG. Tillman’s game largely centers around his pure athleticism with the basketball. While not categorically a shooter, he has no issue finding his way to the paint through traffic. His 6-7, 215 lb frame allows for great versatility when it comes to guarding opponents, and when attacking the glass. Perhaps the craziest stat of his sophomore year was that Tillman led the team in rebounding while only playing 16.5 minutes per game. In a starting slot this season there’s reason to believe he can become the top rebounder in the conference, and one of the top rebounders in all of college basketball. That’s an incredible asset for a team that thrives off of gritty, unselfish basketball. With starters Korey Billbury and Melvin Johnson having graduated, Tillman finally will get the opportunity to step into a starting role his junior season. With added minutes we should see him get more opportunities to take jumpers and work on his perimeter game, as the majority of his scoring thus far has come from inside the paint. Few doubt the fact that Tillman has the agility and strength to play big conference basketball, however he still has work to do in terms of bettering his shot, something he has undoubtedly been practicing in the offseason. Tillman’s ranking at #13 has nothing to do with a lack of talent, but rather with the fact that he is still not completely developed as a well-rounded basketball player. If he’s able to establish himself as a greater scoring threat from outside the paint, his game could grow astronomically. If all goes well, expect to see Tillman on an All-A10 team this spring. Which team that is is completely dependent upon his offensive growth over the next six months. Justin Tillman is a very solid basketball player, and the less his game becomes one-dimensional the greater he will become. I’m surprised by that pick. Washington makes more sense to me. Even Iverson. That pick has to be on potential more than accomplishment.